Many cultures throughout history have used the regularities of numbers and patterns as a means of describing their environment. The ancient Greeks believed that just five archetypal forms – the ‘platonic solids’ – were part of natural law, and could describe everything in the universe because they were pure and perfect. 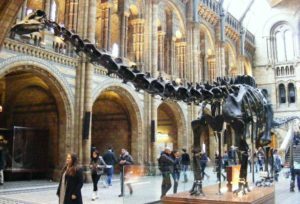 The formation of simple geometric shapes through the interactions of physical forces, and their development into more complex biological structures, supports a re-appreciation of these pre-Darwinian laws. The self-assembly of molecular components at the nano-scale, and their organization into the tensegrities of complex organisms is explored here. Hierarchies of structure link the nano and micro realms with the whole organism, and have implications for manual therapies. Many cultures throughout history have used the regularities of numbers and patterns as a means of describing their environment. The ancient Greeks believed that just five archetypal forms – the ‘platonic solids’ – were part of natural law and could describe everything in the universe because they were pure and perfect (fig.1)Fuller 1975 sec.820.00. This platonic conception of nature persisted up until the mid nineteenth century when Charles Darwin published his revolutionary ‘Origin of Species’, “After Darwin the whole lawful scheme was overthrown and organic forms came to be seen as contingent mutable assemblages of matter – ‘clever artifact like contrivances’ – put together gradually during the course of evolution primarily by natural selection for biological function”.Denton et al 2003 A recognition of natural patterns and shapes derived from physical laws seemed to reassert itself in 1917 when d’Arcy Thompson published his classic ‘On Growth and Form’,Thompson 1961 but in the scientific mainstream this remained little more than interesting. Using simple geometry to describe a complex organism is likely to generate a certain of skepticism, as esoteric and occult descriptions seem rather simplistic compared to modern scientific thinking. However, in 1928 Frank Ramsey proved that every complex or random structure necessarily contains an orderly substructure. His proof established the fundamentals of a branch of mathematics known as Ramsey theory, which is used to study the conditions under which order must appear, such as in large communication networks and the recognition of patterns in physical systems. The theory suggests that much of the essential structure of mathematics consists of extremely large numbers (with very complicated calculations) derived from problems which are deceptively simple.Graham & Spencer 1990; Fuller 1975 sec.227.00 From the perspective of the human body, Ramsey theory implies that simple shapes might form part of that underlying substructure, and an examination of how these could arise through the interactions of physical forces is presented. This supports recent research which reinstates physical law, and not natural selection, as the major determinant of biological complexity in the sub-cellular realms.Denton et al 2003 The development of these shapes into more complex structures, and how they model biology, with implications for manual therapy then follows. One of the problems that nature seems to solve repeatedly is that of the most efficient ways of packing objects close together. A circle drawn on a piece of paper, ie. in two dimensions (2D), demonstrates this. The circle encloses the largest area within the minimum boundary, which makes it a ‘minimal-energy’ shape (requiring the least amount of energy to maintain). Circles enclose space, as well as radiate out into it, as can be seen in a drop of oil floating on water, the growth of fruit mould, and the ripples in a pond. However, this efficiency is severely compromised when several circles are put next to each other as gaps are left in between (fig.2). Other shapes, such as squares and triangles will both fill the space completely, but the proportion of area to boundary is not as good as with the circle. 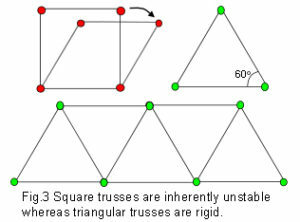 A square is inherently unstable; while triangles are very stable, even with flexible joints (fig.3). Structures that are not triangulated can generate torque and bending moments at their joints, and must be rigidly fixed to prevent them from collapsing. All this would seem to make the triangulated hexagon the obvious choice for close-packing in two dimensions. In 3D, however, a structure which fulfills the same purpose may not be so readily apparent. The ancient Greeks recognised the importance of the five regular polyhedra because of their intriguing properties (Fig.1).Fuller 1975 sec.820.00 Their outer faces are made from shapes which are all the same; a sphere circumscribed around each one will touch all the corners, while one inscribed within will touch the centre of all the faces; and they all have 3, 4 or 5 sides. Joining up the face centres creates the ‘dual’ of that shape, ie the octahedron and cube are duals of each other; and the dodecahedron and icosahedron similarly; the tetrahedron is unique in that it is a dual of itself. Not a hexagon in sight… yet! 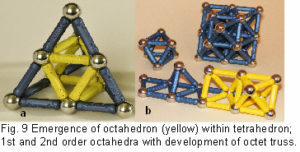 The simplest and most stable arrangement of spheres in 3-D is a tetrahedron, because of its triangles.Fuller 1975 sec.223.87 Methane and ice molecules configure as tetrahedrons; a pile of oranges and grains of sand are rough tetrahedrons; and in the early embryo, four cells arrange as a tetrahedron. Adding more spheres to the tetrahedron produces higher order structures and the emergence of another shape – the octahedron. 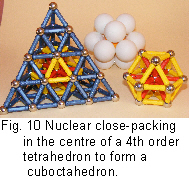 Increasing the tetrahedron to its 4th order (figs.8;10) produces the first close packing of spheres around a central nucleus, and the emergence of another shape – the cuboctahedron (which is not a platonic solid).Fuller 1975 sec.414.00 This shape is also contained within a 2nd order octahedron (fig. 11). The addition of a tetrahedron to each of the 8 triangular faces of the 2nd order cuboctahedron turns it into a cube, or looking at it another way, the cuboctahedron is a cube with the corners cut off. If these were cut away further, it would end up as an octahedron. 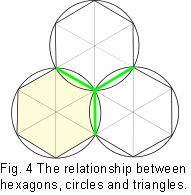 When four corners of a cube are connected diagonally, they enclose a 4th order tetrahedron (fig.13b). 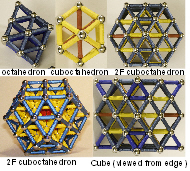 The cuboctahedron and cube are not shapes which generally appear in biological structures, but they are still relevant to the discussion. Table 1 shows a comparison of the relative volumes of these shapes when taking each one as unity. It can be seen that the volume of the tetrahedron is the only standard where all the others can be expressed as integers; the other comparisons leave awkward fractions or irrational numbers which disguises their simple relationships. Man-made structures commonly use cubes with their 90o angles, but these shapes are relatively rare in the natural world where they are constructed from discrete components, and 60o geometry is more prevalent – an observation noted by Buckminster Fuller.Fuller 1975 sec.410.10 An architect of some renown, he formulated a complete system of geometry based on 60o, which applied to a wide diversity of the laws formulated in physics and chemistry. Table 1. A comparison of the relative volumes of different shapes with the same edge length, when taking each one as unity. All these shapes naturally occur as inorganic crystals, and there is no suggestion that they can literally be observed in the human body. This description, however, includes them in a unified and comprehensive approach to understanding natural forms, which are all influenced by the same energy-efficient ways of packing objects of similar size through the interactions of molecular forces. 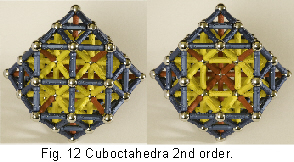 Before getting to more complex structural mechanisms, it is necessary to make a brief return to the cuboctahedron, where it will be noticed that it is constructed from 12 spheres that create four interlocking hexagons around a central nucleus (figs.10;11;17a). Pauling (1964) described it as a ‘coordination polyhedron’ because its minimal-energy configuration is the common denominator of the tetrahedron, octahedron and cube. Fuller (1975 sec.430.00) considered the links between spheres as energy vectors, and called it the ‘vector equilibrium’. This shape has radial and circumferential vectors which are all the same size. In terms of vectorial dynamics, the outward radial thrust from the nucleus is exactly balanced by the circumferentially restraining chordal forces (figs.10;11). 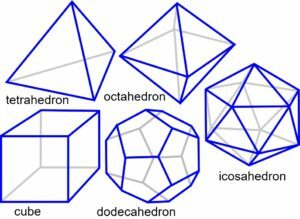 So, as well as the highest degree of symmetry (cubic), we have a coordinating shape (cuboctahedron) and a balance of forces (vector equilibrium), the significance of which will be explained later. 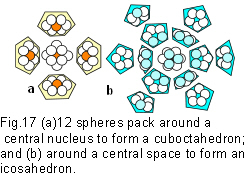 It is even possible to pack spheres tighter and at a lower energy level by removing the nucleus. This allows 12 spheres to compact differently around a smaller central space as 12 interlocking pentagons (figs.17b;18a;b). Joining all the spheres together creates an icosahedron – another platonic solid, but this one is different (fig.18c). Adding more spheres to the outside will not create a higher order, like in the previous shapes, because the spheres won’t all touch (fig.18d). 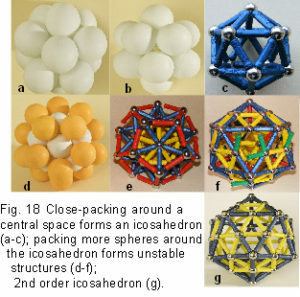 A 2nd order icosahedron won’t close-pack around the basic shape, or a 3rd order around a 2nd, because they would be unstable (figs.18e;f), and can only exist in their own right as a single outer shell. The icosahedron enlarges by subdividing each of its faces into more triangles, which is why it remains stable (fig.18g)(The relative volume compared to the tetrahedron in table 1 is 18.51). In order to understand the full significance of simple geodesic geometry, we must look at another way that the universe uses to deal with complexity, namely, integration. The concepts of tensegrity [tensional integrity] have become increasingly recognized over the last thirty years as a useful model for understanding some of the structural properties of living organisms. Their appreciation follows from investigations in the 1940’s by Kenneth Snelson (website) who constructed sculptures with parts that appeared to defy gravity and float in the air. His structures greatly impressed the architect Buckminster Fuller (1975), that he incorporated them into his developments in structural design and set about exploring the principles underlying their formation. Fuller described two aspects of geodesic geometry based on the icosahedron and referred to them as the geodesic dome and tensegrity. Fuller introduced his geodesic domes during the 1950’s; and because their strength increases as they get bigger, it has been possible to build some very large structures. Some of these can be seen in the Eden project in Cornwall, and protective coverings on radar installations. 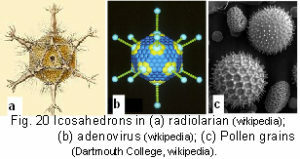 Some natural structures are: ‘Buckyballs’ – a form of carbon named after Fuller – with 60 atoms linked together to form 20 hexagons, interspersed with 12 pentagons – the same as the pattern on a football (actually a spherical truncated icosahedron); viruses; the silica shells of radiolaria; pollen grains; clathrins (endocytic vesicles beneath the cell membrane); and the cellular cytoskeletal cortex (fig.20). 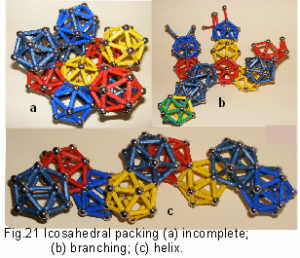 Multiple icosahedra can arrange neatly together in a thick planar sheet because of their hexagonal outline (figs.7b;18c), making the hexagon the link between space filling in 2D and the icosahedron in 3D. They can stack in a column or helix; branch or pack around each other (incompletely) to create curved surfaces; and form more complex patterns and shapes in 3D (fig.21). In contrast, tetrahedral and octahedral based trusses are not omnidirectional in form and function; they have a smaller volume to surface area ratio; they do not close-pack at all well and their shapes do not self-generate. Cubes and dodecahedra are also inherently unstable unless they are triangulated, but will not be considered further at this point. However, they are still significant to later discussion. 1. Stability – achieved through the configuration of the whole network, and not because of the individual components. It is also omnidirectional, with the different elements maintaining their respective properties regardless of the direction of applied load. 2. Balance – the tension and compression components are separated and balanced mechanically throughout the entire structure, which will optimize automatically so as to remain inherently stable. The geodesic dome has been considered distinct from tensegrity for the purpose of description so far – one has all the struts touching, and the other has them all separated; although tension maintains their integrity in both cases, and they are really both prestressed.Fuller 1975 sec.703.03 They seem to be poles at opposite ends of a continuum, although even this distinction is an illusion, as will be explained. A definition which satisfies all researchers has so far remained elusive, because some aspects relating to mechanical engineering do not apply to biology, and the following examples use a broad and inclusive approach. Their non-linear stress-strain relationship is an essential aspect of biological materials where it has been related to the differing properties of components in their nano and micro structures (figs.24;29);Gordon 1978 p164; Lakes 1993; Skelton et al 2001; Puxkandl et al 2002; Gao et al 2003; Gupta et al 2006 one of the smallest of these is the helix. Biological helixes are stabilized through a balance between the attraction (tensional) and repulsion (compressional) forces within the molecule, which makes them tensegrities in their own right. They can also flex without buckling, lengthen without breaking, and are capable of rotation without deformation.Stecco 2004 All known filamentous viruses are helical (most of the rest are icosahedral) fig. 20b;21c). This arrangement of different components at varying size scales is a common feature in biology, where the functions of each one contribute to a higher collective function within a hierarchy of structures (figs.24;29). The extracellular matrix, surrounding virtually every cell in the body, provides a branching structural framework which extends through the fascia to the whole organism. It attaches to the cellular cytoskeleton through adhesion molecules in the cell membrane, allowing a transfer of mechanical forces between them and changes in the cytoskeletal tension.Ingber 2003a,b,2008 Multiple intra-cellular signalling pathways are activated as a result which provide multiplexed switching between different states such as cell growth, differentiation or apoptosis. Conversely, local tensional stresses within the cytoskeleton transfer to the extracellular matrix and produce effects on other cells at some distance. Long-distance transfer of mechanical forces between different tissues could then spatially orchestrate their growth and expansion, allowing complex multi-cellular tissue patterns to emerge through interactions among a hierarchy of different components. Multi-modular hierarchies of form and function can thus be linked, with simplicity evolving into complexity, and the whole system mechanically functioning as a unit.Stecco 2004 p25; Nelson et al 2005; Ingber 2006a,2008; Parker & Ingber 2007 As a self-organizing tensegrity construction system, the matrix could repair and replace itself at a local level, by allowing small and incremental changes compatible with the mechanical demands of all its components. Stecco (2004 p31) described the fascia as a tensioned network which may coordinate the motor system in a way that the central nervous system is incapable of. 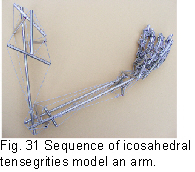 The icosahedron is particularly useful in modelling the tensegrities of biological structures, because it demonstrates both geodesic dome and tensegrity properties which can be connected to form an infinite variety of shapes (figs.21;23;31). 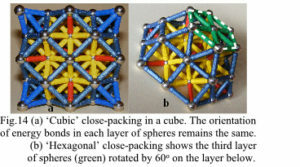 Even the tension and compression elements can be made from interlinked icosahedra, themselves constructed from smaller icosahedra, repeating further in a self-similar structural hierarchy.Fuller 1975 sec.740.21; Ingber 2003a; Levin 2007 Curved compression elements differ from straight struts (fig.22) because their outer convex surfaces are under tension and their inner concave surfaces are under compression. Biological materials deal with both types of loading by separating them into nano and micro structures within a hierarchy.Gordon 1978; Lakes 1993; Puxkandl et al 2002; Gao et al 2003; Gupta et al 2006; Brangwynne et al 2006 Inferences that this is ultimately due to their tensegrity construction have been made.Skelton et al 2001; Levin 2007; Ingber 2008 In addition, when spheres are added to the outside of an icosahedron they do not close-pack completely, and an instability develops (figs.18d-f;21a). 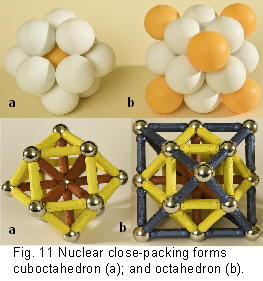 This apparent ‘flaw’ in the packing arrangement allows another possibility for modelling an infinite variety of shapes, as different parts of the structure branch outwards, and the spaces in between can fill with smaller icosahedra. It may now be seen that the distinction between geodesic dome and tensegrity is really just relative to the scale at which they are observed, a corollary which should be added to any definition. Even the close-packing of atoms (spheres) should be considered as a ‘tensegrity with invisible struts’ because their centres of mass are held a minimum distance apart.Connelly & Back 1998 Distinctions of structure and function in biology may essentially be points on a continuum and artefacts of textbook classification. Although geodesic domes appear limited to the cellular size level, tensegrities almost certainly dominate beyond this. At the macro scale the fascia, muscles, ligaments and capsules provide the tension; while the bones and tissue bulk of muscles, organs and fluid-filled vessels resist compression. Joint movements display helicoid motion around a variable fulcrum and this is demonstrated in the simple tensegrity elbow in figure 31, a physiological feature not found in most other models. According to Wolff’s law, tensional forces remodel the bony contours and alter the positions and orientations of their attachments, contributing to the complexity of shapes apparent in the skeleton.Kushner 1940; Kjaer 2004 As part of a tensegrity structure, each attachment would influence all the others, distributing forces throughout the system and avoiding points of potential weakness;Skelton et al 2001; Masic et al 2006 in contrast to a pure geodesic chain or truss which is vulnerable to buckling (fig.21c). Such a mechanism would be an advantage in long-necked animals such as giraffes and dinosaurs, where the load from the head is distributed throughout the neck (fig.23).Levin 1982 The erect spine and bipedal weight bearing capability of humans has traditionally been viewed as a tower of bricks and compressed disc joints, transferring the body weight down through each segment until it reaches the sacrum, but this is a relative rarity amongst vertebrates. Most other species have little or no use for a compressive vertebral column, which is frequently portrayed as a horizontal truss and cantilever support system.Thompson 1961 p245; Gordon 1978 p239 As the main difference in vertebrate anatomies is in the detail, it seems reasonable to suppose that they have some structural properties in common.Levin 1982;2002 Tensegrities are omni-directional, i.e. they are stable irrespective of the direction of loading; and the spine, pelvis and shoulder all demonstrate this property (within physiological limits), enabling dancers to tip-toe on one leg, and acrobats to balance on one hand. red to work against the old equilibrium. Skelton et al 2001; Masic et al 2006 Their high yield strain allows large shape changes to be accomplished at no loss in stiffness Masic et al 2006 a distinctive feature in biological structures. The icosahedron has been described as an intermediary in a potential oscillating system Fuller 1975 sec.460.08 with similarities to an energy efficient pump. Levin 2002 If the vector equilibrium (cuboctahedron)(fig.11a) is constructed without radial vectors and joined with flexible connectors, and is compressed between two opposite triangular faces, it will contract and rotate symmetrically (due to the instability of the square faces) and assume the shape of the slightly smaller icosahedron (each of the square faces now becomes a rhomboid, or essentially, two triangles). Further compression causes the equator to twist and fold, and the structure transform itself through an octahedron, to the tetrahedron, and back again. The icosahedron is at the lowest energy state within the system, and the point around which changes in shape occur. Fuller called this mechanism the ‘jitterbug’.Fuller 1975 sec.460.00 An organism utilizing such a system would be able to move with the minimum of energy expenditure, and remain stable whilst changing shape. 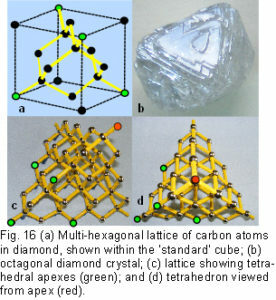 The ubiquitous nature of symmetry offers a simple explanation for stable crystal lattices and other regular patterns, because of the balance of forces. Instabilities in the dynamics of living systems also generate complex patterns and shapes within hierarchies of structure, as self-similar shapes (fractals) scale up through dilation – one of the four principal types of symmetry transformation. Organization is still part of the self-assembly capacity, but the resulting form may have a very different appearance from its component substructures (figs.24;29) “…and be arranged into almost any contingent artefactual arrangement we choose”.Denton et al 2003 Correlations with ‘60o geometry’ at the macro scale may then be more coincidental; Phalen et al 1978; Thomas et al 2005 and description such as ‘close-packing of the knee in full extension’ means something different to ‘close-packing of spheres’. Energy consumption is the key to understanding the structural complexities of living organisms, and as energy-efficient structural mechanisms, tensegrities apply at every level from the atom to the whole body. The icosahedron links the simple geometry of the platonic solids to the tensegrities of complex shapes, and lends itself to their modelling. It also becomes a transient in energy-efficient transformations of shape, through the ‘jitterbug’ system described by Fuller. As a tensioned tensegrity network, the fascia may have a coordinating function throughout the body; and as manual therapies make contact at the whole body level, it provides a pathway for therapeutic interventions right down to the molecular scale. I wish to express my appreciation to Stephen Levin for information on the icosahedron which initiated this article, and to Nic Woodhead, Chris Stapleton and Andrea Rippe for the opportunity to discuss some of these concepts with helpful feedback. Also to Rory James for the photographs in figures 9-12 & 15. Angelsky OV, Tomka YY, Ushenko YG and Ushenko YA. 2005 Investigation of 2D Mueller matrix structure of biological tissues for pre-clinical diagnostics of their pathological states. Journal of Physics D: Applied Physics. 38:4227-4235. Bassnett S, Missey H and Vucemilo I. 1999 Molecular architecture of the lens fiber cell basal membrane complex. Journal of Cell Science 112:2155-2165. Brangwynne CP, Mackintosh FC, Kumar S, Geisse NA, Talbot J, Mahadevan L, Parker KK, Ingber DE and Weitz DA. 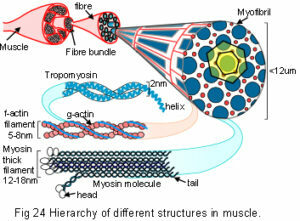 2006 Microtubules can bear enhanced compressive loads in living cells because of lateral reinforcement. Journal of Cell Biology 173;(5):733-741. Caspar DLD. 1980 Movement and self-control in protein assemblies. Quasi-equivalence revisited. Biophysical Journal 32;(1):103-133. Connelly R and Back A. 1998 Mathematics and tensegrity. American Scientist 86:142-151. Coughlin MF and Stamenovic D. 2003 A prestressed cable network model of the adherent cell cytoskeleton. Biophysical Journal (84):1328-1336. Crick FHC. and Watson JD. 1956 Structure of small viruses. Nature 177;(4506):473-475. Denton MJ, Marshall CJ and Legge M. 2002 The protein folds as platonic forms: new support for the pre-Darwinian conception of evolution by natural law. Journal of Theoretical Biology 219:325-342. Denton MJ, Dearden PK and Sowerby SJ. 2003 Physical law not natural selection as the major determinant of biological complexity in the subcellular realm: new support for the pre-Darwinian conception of evolution by natural law. BioSystems 71:297-303. Du N, Liu XY, Narayanan J, Li L, Lek Min Lim M and Li D. 2006 Design of superior spider silk: from nanostructure to mechanical properties. Biophysical Journal 91;(12):4528-4535. Fuller BB. 1975 Synergetics, explorations in the geometry of thinking. Macmillan. Gao H, Ji Baohua, Jager IL, Arzt E and Fratz P. 2003 Materials become insensitive to flaws at nanoscale: lessons from nature. Proceedings of the National Academy of Science 100;(10):5597-5600. Goldberger AL, Rigney DR and West BJ. 1990 Chaos and fractals in human physiology. Scientific American 262;(2):42-49. Gordon JE. 1978 Structures, or why things don’t fall down. Penguin. Graham RL and Spencer JH. 1990 Ramsey theory. Scientific American (Jul):80-85. Gupta S and van der Helm FCT. 2004 Load transfer across the scapula during humeral abduction. Journal of Biomechanics 37;(7):1001-1009. Gupta HS, Seto J, Wagermaier W, Zaslansky P Boesecke P and Fratzl P. 2006 Cooperative deformation of mineral and collagen in bone at the nanoscale. Proceedings of the National Academy of Science 103;(47):17741-17746. Heidemann SR, Kaech S, Buxbaum RE and Matus A. 1999 Direct observations of the mechanical behaviors of the cytoskeleton in living fibroblasts. Journal of Cell Biology 145;(1):109-122. Ho MW, Haffegee J, Newton R, Zhou YM, Bolton JS and Ross S. 1996 Organisms as polyphasic liquid crystals. Bioelectrochemistry and Bioenergetics 41:81-91. Ingber DE, Madri JA and Jamieson JD. 1981 Role of basal lamina in neoplastic disorganization of tissue architecture. Proceedings of the National Academy of Science 78;(6):3901-3905. Ingber DE, Heidemann SR, Lamoureux P and Buxbaum RE. 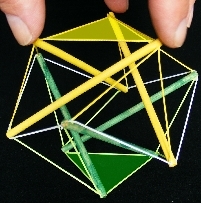 2000 Opposing views on tensegrity as a structural framework for understanding cell mechanics. Journal of Applied Physiology 89:1663-1678. Ingber DE. 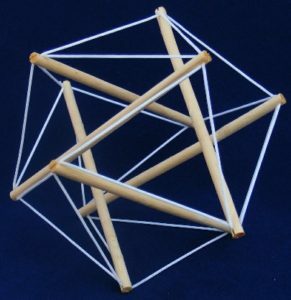 2003a Tensegrity I. Cell structure and hierarchical systems biology. Journal of Cell Science 116;(7):1157-1173. Ingber DE. Tensegrity II. 2003b How structural networks influence cellular information processing networks. Journal of Cell Science 116:1397-1408. Ingber DE. 2006a Cellular mechanotransduction: putting all the pieces together again. The FASEB J 20;(7):811-827. Ingber DE. 2006b Mechanical control of tissue morphogenesis during embryological development. International Journal of Developmental Biology 50:255-266. 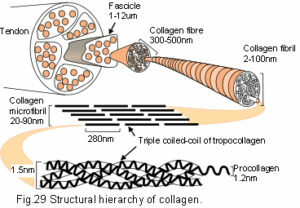 Jager I and Fratzl P. 2000 Mineralized collagen fibrils: a mechanical model with a staggered arrangement of mineral particles. Biophysical Journal 79:1737-1746. Jelinek HF, Jones CL, Warfel MD, Lucas C, Depardieu C and Aurel G. 2006 Understanding fractal analysis? The case of fractal linguistics. Complexus 3:66-73. Knight DP and Vollrath F. 2002 Biological liquid crystal elastomers. Philosophical Transactions of the Royal Society of London B 357:155-163. Kreigh M and Kreigh J. 2003 Growth, form and proportion in nature: lessons for human habitation in off planet environments. 33rd International Conference on Environmental Systems, Vancouver, Canada. Kushner A. 1940 Evaluation of Wolff’s law of bone formation. Journal of Bone and Joint Surgery 22:589-596. Kushner DJ. 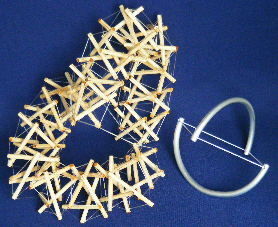 1969 Self-assembly of biological structures. Bacteriological Reviews 33;(2):302-345. Lakes R. 1993 Materials with structural hierarchy. Nature 361:511-515. Levin SM. 1982 Continuous tension, discontinuous compression: a model for biomechanical support of the body. The Bulletin of Structural Integration 8(1). Levin SM. 1995 The importance of soft tissues for structural support of the body. Spine: state of the art reviews. Dorman,T. ed. 9;(2):357-363 Hanley and Belphus, Philadelphia. Levin SM. 1997 Putting the shoulder to the wheel: a new biomechanical model for the shoulder girdle. Journal of Biomedical Sciences Instrumentation 33:412-417. Levin SM. 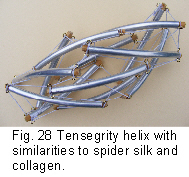 2002 The tensegrity truss as a model for spine mechanics: biotensegrity. Journal of Mechanics in Medicine and Biology 2;(3&4):375-388. Levin SM. 2005a The scapula is a sesamoid bone. Journal of Biomechanics 38;(8):1733-1734. Levin SM. 2007 A suspensory system for the sacrum in pelvic mechanics: biotensegrity. In: Vleeming A, Mooney V, Stoeckart R. eds. Chapter 15 in Movement, stability and lumbopelvic pain. Churchill Livingstone. Li J, Dao M, Lim CT and Suresh S. 2005 Spectrin-level modeling of the cytoskeleton and optical tweezers stretching of the erythrocyte. Biophysical Journal 88;(5):3707-3719. Liu SC, Derik LH and Palek J 1987 Visualization of the erythrocyte membrane skeleton. Journal of Cell Biology 104:527-536. Maguire P, Kilpatrick JI, Kelly G, Prendergast PJ, Campbell VA, O’Connell BC and Jarvis SP. 2007 Direct mechanical measurement of geodesic structures in rat mesenchymal stem cells. Human Frontier Science Program Journal 1;(3):181-191. Mandelbrot B. 1983 The fractal geometry of nature. Freeman. Masic M, Skelton RE and Gill PE. 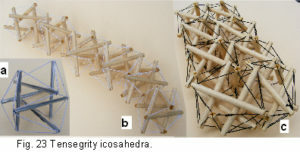 2006 Optimization of tensegrity structures. International Journal of Solids and Structures 43:4687-4703. Nelson CM, Jean RP, Tan JL, Liu WF, Sniadecki NJ, Spector AA and Chen CS. 2005 Emergent patterns of growth controlled by multicellular form and mechanics. Proceedings of the National Academy of Science 102;(33):11594-11599. Parker KK and Ingber DE. 2007 Extracellular matrix, mechanotransduction and structural hierarchies in heart tissue engineering. Philosophical Transactions of the Royal Society B: Biological Sciences. 2114:1-13. Pauling L. 1964 The architecture of molecules. Proceedings of the National Academy of Science 51:977-984. Palagyia K, Tschirrena J, Hoffman EA and Sonka M. 2006 Quantitative analysis of pulmonary airway tree structures. Computers in Biology and Medicine 36:974–996. Perumal S, Antipova O and Orgel JPRO. 2008 Collagen fibril architecture, domain organization, and triple-helical conformation govern its proteolysis. Proceedings of the National Academy of Science 105;(8):2824-2829. Phalen RF, Yeh HC, Schum GM and Raabe G. 1978 Application of an idealized model to morphometry of the mammalian tracheobronchial tree. Anatomical Record 90:167-176. Puxkandl R, Zizak I, Paris O, Keckes J, Tesch W, Bernstorff S, Purslow P and Fratzl P. 2002 Viscoelastic properties of collagen: synchrotron radiation investigations and structural model. Philosophical Transactions of the Royal Society of London B: Biological Sciences 357:191-197. Read HH 1974 Rutley’s elements of mineralogy 26th ed. Thomas Murby & Co, London. Sanner MF, Stolz M, Burkhard P, Kong XP, Min G, Sun TT, Driamov S, Aebi U and Stoffler D. 2005 Visualizing nature at work from the nano to the macro scale. NanoBiotechnology 1:7-21. Scarr GM. 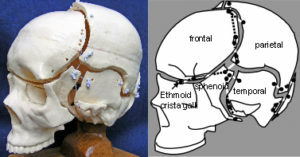 2008 A model of the cranial vault as a tensegrity structure, and its significance to normal and abnormal cranial development. International Journal of Osteopathic Medicine 11;(3):80-89. Skelton RE, Adhikari R, Pinaud JP, Chan W and Helton JW. 2001 An introduction to the mechanics of tensegrity structures. Proceedings of the 40th IEEE Conference on Decision and Control 5:4254-4259. Stecco L. 2004 Fascial manipulation for musculoskeletal pain. Piccin Nuova Libraria, Padova. Stewart I. 1998 Life’s other secret: The mathematics of the living world. Penguin. Sunada T. 2008 Crystals that nature might miss creating. Notices of the American Mathematical Society 55;(2):208-215. Sung LA and Vera C. 2003 Protofilament and hexagon: A three-dimensional mechanical model for the junctional complex in the erythrocyte membrane skeleton. Annals of Biomedical Engineering 31;(11):1314-1326. Teo BK and Zhang H. 1991 Clusters of clusters: Self-organization and self-similarity in the intermediate stages of cluster growth of Au-Ag supraclusters. Proceedings of the National Academy of Science 88:5067-5071. Termonia Y. 1994 Molecular modeling of spider silk elasticity. Macromolecules 27:7378-7381. Thomas JB, Antiga L, Che SL, Milner JS, Hangan Steinman DA, Spence JD, Rutt BK and Steinman DA. 2005 Variation in the carotid bifurcation geometry of young versus older adults.Stroke 36:2450-2456. Thompson d’Arcy W. 1961 On growth and form. Bonner, J.T. ed., Cambridge University Press. Van der Veen AC. 2003 Biomechanica: Bewegen, sport en manuele geneeskunde. Symmetrie en asymmetrie. Sportgericht 57;(5). Van Workum K and Douglas JF. 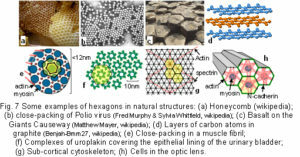 2006 Symmetry, equivalence, and molecular self-assembly. Physical Review 73;(3pt1)(031502):1-15. Weinbaum S, Zhang X, Han Y, Vink H, and Cowin SC. 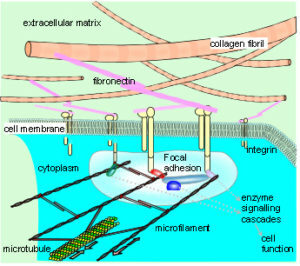 2003 Mechanotransduction and flow across the endothelial glycocalyx. Proceedings of the NationalAcademy of Science 100;(13):7988-7995.
on Intelligent Robots and Systems. 3571-3578. Zamir M. 2001 Arterial branching within the confines of fractal L-system formalism. The Journal of General Physiology 118;(3):267-276. Zhu Q, Vera C, Asaro RJ, Sche P and Sung LA. 2007 A hybrid model forerythrocyte membrane: A single unit of protein network coupled with lipid bilayer. Biophysical Journal 93:386-400.